Even if you’ve never been to London before, you’ve seen it on film. 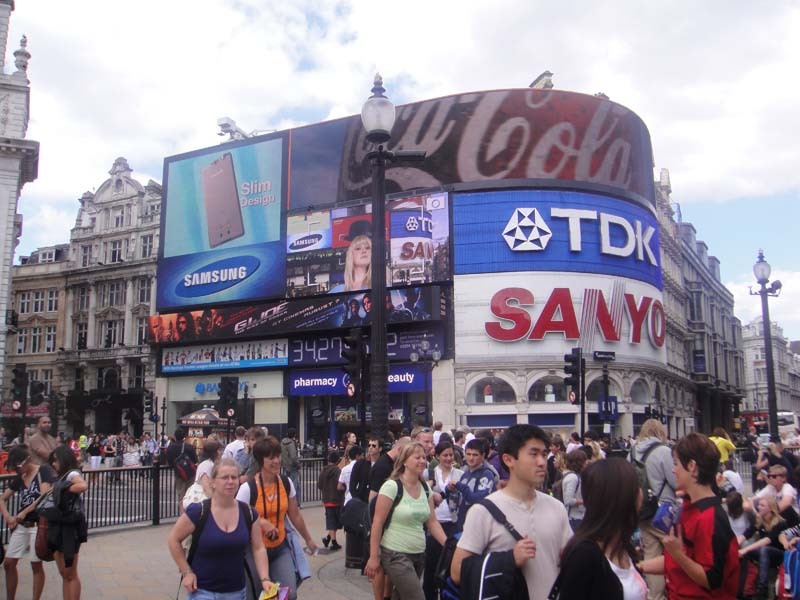 London is a popular setting for movies and television shows by British and American producers. Continue reading for ten famous London landmarks you’ve seen on the silver screen and how you can find them in real life. This majestic addition to the city’s skyline is a Ferris wheel located on the bank of the Thames. London Eye was built in 2000 for the millennial celebrations and had a major role in “Fantastic Four: Rise of the Silver Surfer,” when the four have to work together to keep it from being destroyed. “Wimbledon” also has a scene in one of the capsules. In “The DaVinci Code,” the action should have taken place at Westminster Abbey, near Westminster tube station. However, due to filming restrictions, the moviemakers shot some important interior scenes at Lincoln Cathedral, which is in Lincoln, north of London. The exterior shots, however, are of this famous London landmark. It is where Sir Isaac Newton is interred. Made internationally famous in the film “Notting Hill,”starring Hugh Grant and Julia Roberts, the Portobello Road Market is truly located at Notting Hill and runs daily except for Sundays. It features a plethora of items, from food to antiques. If you’re searching for the blue door Grant’s character lived in, it’s rumored the current owners have repainted it. There wasn’t a Platform 9 ¾ until someone decided to install one after the wildly successful J.K. Rowling tales about the boy wizard and his pals, but you can see it at the King’s Cross Station. London’s Underground is featured in plenty of movies — including some of the late “Harry Potters”— but many horror movie buffs remember it best from “An American Werewolf in London.” When the backpacker werewolf attacks a London commuter, he does it at Tottenham Court Road, an easy place to find using a transport map. Located on Queen Anne Street, the Chandos House still looks the same now as it did on the set of the movie adaptation of Jane Austen’s book. It isn’t open to the public, but is available for private functions. The house has also been a set in older films; “Reds” and “The Big Sleep” both shot scenes here. The Tate Modern gallery is mentioned in many films, Woody Allen’s “Match Point” among them. Its restaurant provides a few scenes for the “Bridget Jones” series when she gets together to eat with her smug-married friends. A backdrop for many films, notably “The King’s Speech,” Regent’s Park is located in central London. The park’s zoo was the setting for the scene in the first “Harry Potter” movie, when Harry frees a giant boa constrictor to the horror of everyone around him. Hugh Grant fans will also notice it’s where Grant’s character in “About a Boy” hoped to pick up single women. Near London Bridge, this market plays an important role in the setting of Renee Zellweger’s “Bridget Jones”movies.“The Imaginarium of Dr. Parnassus” also filmed here, as the site where the imaginarium was set up. About the Author: Cherry Santiago has worked in the film industry for 15 years, first as a make-up artist and then as a set designer. If you’re going to London for the first time, she advises there are many hotels in London on Venere.com near these attractions. So you’ve decided to visit Cornwall, England for you holiday and want it to be action packed and full of adventure, so where do you go and what do you do? Here are five places to visit as well as a place to eat and a find your perfect place to stay. Newquay in a beautiful coastal town famed for its surfing. There are also marvellous scenic walks and beaches to enjoy whilst there. If water is your thing, then this attraction is just for you. 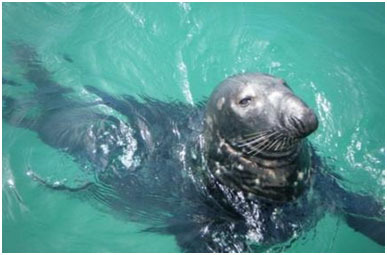 There are sea safaris to Seal Cove which last two hours and leave from Newquay Harbour. As you cruise along the Cornish coastline, look out for dolphins, deals, basking sharks, sunfish, harbour porpoise and plenty of sea birds.You will be taught along the way by marine wildlife guides and may even spot crabbing boats hauling their catch. If you are feeling brave, there is the opportunity to swim with basking sharks or cage dive with blue sharks. If you aren’t a shark lover but want to go underwater, how about some snorkelling or diving. The diving can last half a day or a full day and there are over 300 wrecks to explore. If you love to fish, there are fishing trips which last for two hours, half a day or a full day. You’ll be able to catch fish under the expert tuition of skippers and you can keep the fish you catch to cook for your dinner. This is open all year so there are plenty of chances to see the views and enjoy the activities. There are plenty of activities to enjoy here such as waveski, kite surfing, kite buggy, land boarding and traction kite lessons for the adrenaline junkies amongst you. 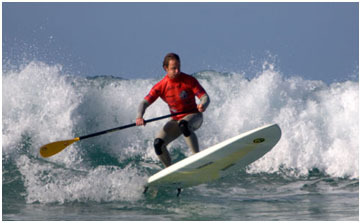 You can try one or two sports or try them all with an ‘Extreme Day’. There is two miles of sand and consistently good surf here so it is an exceptional environment for water and land sports in the great outdoors. Lessons are tailored to suit you and your ability from beginners to experts and you can learn at a pace that suits you. You’ll learn in small groups with the latest equipment and this is done all year round. After all that exercise, you can recharge your energy levels in the Beach Hut. It serves snacks, lunches and dinners and is right next to the sand so provides a brilliant place to watch the sunset. The castle and gardens overlook Porthluney Cove on the south Cornish coast so you get sea views and as its set in 100 acres of beautiful woodland, you get a peaceful tranquil feel too. The Williams family live in the castle but you can take a guided tour to delve into outstanding English heritage. 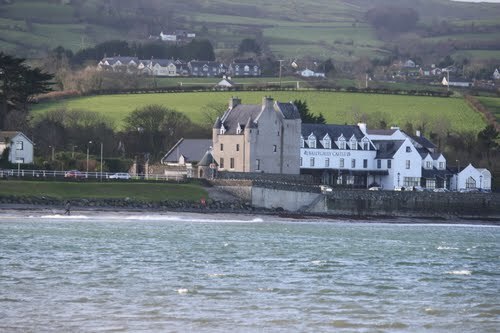 The family have resided in the castle for over 150 years and there was only one family there before them. The gardens and castle are open to the public from February to May each year. 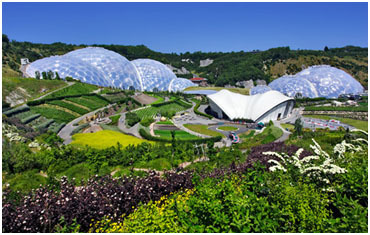 The Eden project is a global garden housed in tropical conditions and has even been dubbed the eighth wonder of the world so is well worth a visit if you are down in this part of the country. It is fast-becoming a unique resource for education and knowledge towards a sustainable future but it is also a fun family day out. There are activity days, music concerts, gardening courses and the chance to find out where tea, rubber and sugar come from as you take a tour of the world from South Africa, California, the Mediterranean and back to Cornwall. There are stunning garden displays all year round, sculptures and art, an ice rink in winter, local fairly traded food available in the restaurant and café as well as a rainforest lookout that takes you above the treetops. If you’d prefer to see it all from the ground, there’s a free land train which is pulled by a tractor. There’s always so much going on so check the events calendar to make the most of your visit or you could event hold a conference or wedding there as it’s open all year except Christmas. If you are feeling hungry or thirsty, get yourself to Newquay to The Meadery. They serve platters of hot savoury food and fine ales as well as catering for vegetarians and they have a varied children’s menu. 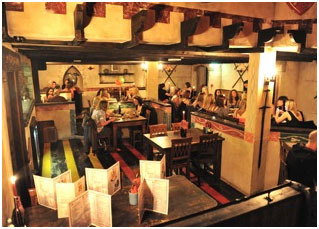 It’s a popular and lively venue that has been kitted out in medieval style furniture but has a modern day buzz about it. You’ll see suits of armour, swords, mace and stocks and enjoy the candles which emphasise the medieval theme. And of course whilst you’re there you’ll need somewhere to stay. www.holidayhomestoyou.co.uk provides a great service where you can browse a specific location to stay and see what type of properties are available or even better, you can request where you’d like to stay and they will find somewhere for you as holiday home owners contact you with places that meet your requirements. This article was written by Charlotte Schroeter, a Media Studies Undergraduate living in Sussex. Follow her on Twitter @charlotte_a_s. 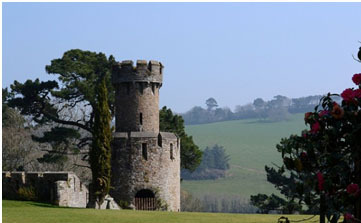 Stag parties in the south west of England are jam packed with activity opportunities. As well as being conveniently close to the seaside resort of Weston-super-Mare – for free reign on surfing and other watersports – Bristol breaks offer plenty of bookable pursuits to consider. With so much choice on activity, don’t be restricted by expensive basics and save with stag weekend packages through Travelodge group accommodation offers. Bristol is a stunning city rich in heritage and a cosmopolitan destination for a stag party weekend. 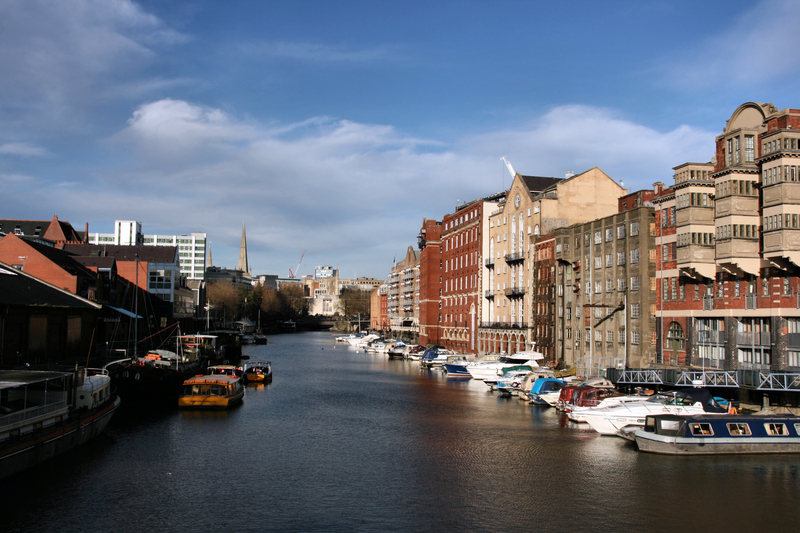 The city is centred on the River Avon, with a collection of bars and restaurants spread along the waterway. The Bristol Ferry Harbour Pub Cruise is an alternative way to move about the best bars in the city. Lasting approximately three hours, this is an excellent way to spend a Saturday afternoon before hitting the main party scene later in the day. The boats are covered and heated ensuring that however the British weather wants to play it, your fun is ensured. As well as many stop offs between the docks, the onboard bar guarantees that you’ll have as much fun onboard as you do on land. Let’s not forget the typical typecasts for Bristolians. A stay in the West Country insists you embrace the ‘combine harvester’ dialect and the residents’ particular fondness for cider. West Country Games is a locally based company that really celebrates the stereotypes of Bristol culture. The fun based activities include aptly named knockouts including The Cider Run, Crazy Combines and Vicky Pollard Handbags. The company can arrange packages for stag parties which include ten games, ‘Minxy Milk Maids’ and West Country picnic lunches. There’s so much to do in the city that you’ll hardly see the walls of your hotel room. Save with stag weekend packages through Travelodge, by paying bargain rates on your stag party accommodation. One of the best places to visit in all of England, the town of Windsor has many amenities as it is the home of the royal family. Just south of the River Thames and west of London, Windsor is only about a forty minute drive from hotels in London making Windsor a perfect day trip. Some of the finest residences in all of the United Kingdom are located here. Of course, many travelers come to tour the Windsor Castle, but the town itself has many other points of interest to anyone planning a visit. The history of this region is ancient. Archeological discoveries date to the Paleolithic Period. 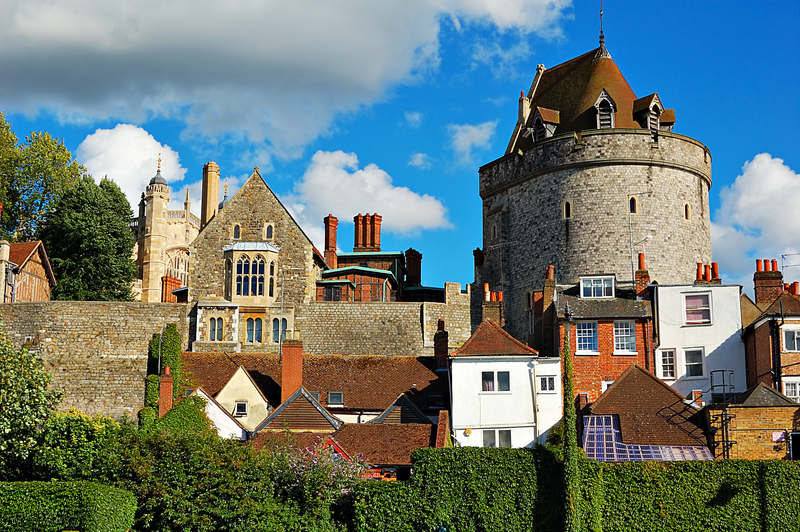 Right from the establishment of this town of "New" Windsor in the 1200s A.D, the settlement was privileged because of its location as home of the royal family. By the 1300s the town was one of the wealthiest in England. Even the "Black Death" that hit much of the country did not kill too many people in isolated Windsor. 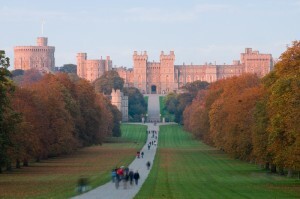 While Windsor Castle was being built in the 1500s, the town of Windsor was a pilgrimage destination. Today, most of the streets and buildings date from the 1700s and 1800s, but Peascot Street, or Peascod Street as it is also known, is still much as it was originally built. 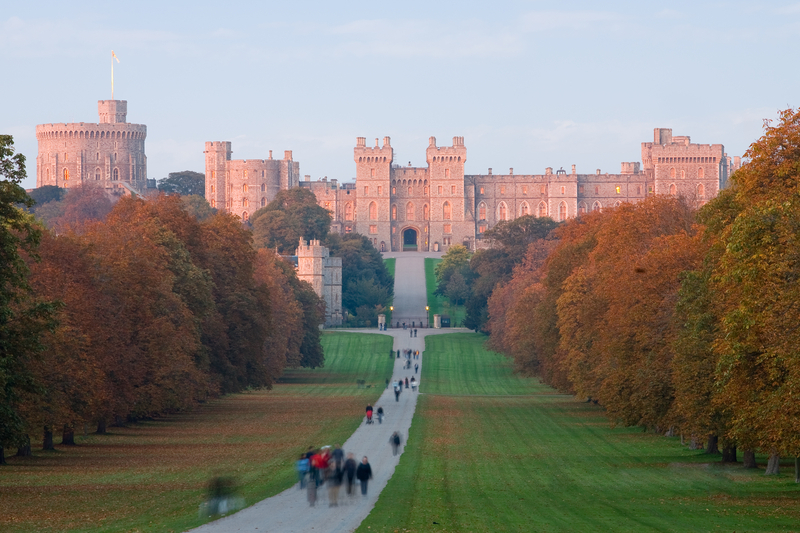 With many fine hotels, fabulous shopping and restaurants, visitors can enjoy a royal stay in Windsor. 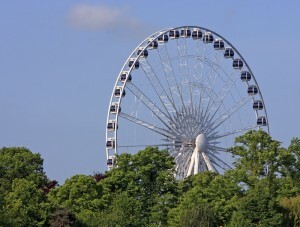 This lovely riverside garden is usually the home of the Royal Windsor Wheel. Very infrequently, the wheel is borrowed by other parks. The ride climbs 50 metres into the sky and each enclosed gondola is air conditioned. From its location in Alexandra Gardens, those who ride can view a long expanse of the River Thames and the surrounding countryside. If the day is very clear, the London Skyline is visible. This park was the location of Windsor Safari Park until 1996 when it became Legoland, a child inspired theme park. Lego theme rides, amazing models and interactive workshops entertain guests. This Legoland is much like the other fun Legoland parks worldwide. Originally only for the royals, this 5,000 acre deer park was for private hunting. Now, with historical monuments and lodges to view, as well as scenic wooded, meadow and grassy areas, this park is available to the public. The Village, where castle workers lived from the 1930s, is open to visitors and has a gift shop. Another whirl wind trip to London to see a Royal Wedding? I don’t think so. Considering my invitation had gotten lost in the mail, I guess. Arriving in London on Thursday morning, and after taking my much needed nap after flying all night across the north Atlantic, I headed out the hotel door. Fighting off the effects of jetlag, not enough sleep and my stomach telling me it was hungry , I decided to take off walking in the direction of Kensington Park in search of food. I found this little Italian restaurant on Kensington Highway to take care of my hunger issues, with a nice lunch of salmon and shrimp salad, I finished off the meal with a Gelato to go and headed off into Kensington Park . Grogginess now wearing off, I started thinking how I was going to spend the afternoon in London. Spying one of the many Barclays bike stands that now can be found all over London I decided to go bike riding. Blue bike in hand where does one go?, well just start riding and see where you end up. Off thru Kensington Park and into Hyde Park it was not long before I made my way to the streets of London. Weaving in and out of red double decker buses, I found it was really not that difficult remembering to stay on the left side of the road. Within minutes I was flowing and jocking for position with the London traffic, this was a rush, I felt like a Londoner, a local, yeah that’s me, a American Yank, a local in London. It wasn’t long before I was in front of Buckingham Palace, what a circus, I mean it usually is busy around the Palace, but with a Royal Wedding a day away , it was a zoo. People were all ready camped out waiting for a good spot, you’d think they were waiting for the next IPAD. I found the bike was perfect for getting around and through this madness. Riding down the Mall, the streets was just lined with tents, film crews and people waving flags from all over the world. A quick jaunt around Trafalgar Square, saw the place looking like a rock concert in the making. I mean if your coming to see the sights of London you would have a hard time finding anything under all the stages and scaffolding going up around the city. Already in this part of town and easy to get around with the bike, I found myself within a couple of minutes in front of Westminster, grab somebody to take my picture, just to say I have been here and I am out of here. Headed back to the hotel, I was really enjoying this bike ride through one of the world’s largest cities. I was thinking next time I should get my helmet, place my GoPro camera on top and film at ride through London. What a great way to spend a afternoon in London. Since I was not invited to the Royal Wedding I will be heading out Friday before all the hoopla really gets going. Woke up today with fax under door that my flight from London back to New York was canceled due to inbound flight not arriving because of weather back in States. Now Scheduled to fly back Saturday afternoon, means an extra day in London. Ok, I have extra day in London, what’s one to do? Think I’ll do a day trip and head up to Salisbury and Stonehenge , overcast skies but decent weather and not wanting to waste a day I grabbed my Oyster card an headed to the London Underground and made my way from Gloucester Station to Waterloo Train Station. Waterloo Train station to Salisbury on South West Trains, ticket cost 32.80 pounds, with ticket in hand and trains leaving almost 2 times an hour I had 7 min to catch the next train, perfect timing. Pulled out my IPhone , checked GPS, train averaging 95 mph, not bad. Total travel time between London Waterloo train station and Salisbury was 90 minutes. Being a spur of the moment trip and not having researched various options I decided to take a tour bus from Salisbury train station. The Tour Bus was located right outside of Salisbury Train Station or can be picked up in town. The tour I chose was 22 pounds which included Stonehenge , Old Sarum and Salisbury Cathedral. First stop Stonehenge, 9 miles on the outskirts of Salisbury, With temperature in the 40, light mist and being wintertime there was very few people at Stonehenge. Perfect for taking in this World Heritage Site. The weather also gave the viewing a kind of mystical atmosphere, Pretty amazing to finally see the size of the stones and try and figure how they got here some 4000 years ago. Not only how they transported the stones here, but how they were cut with such precision, I mean some of the stones were so straight it was amazing when you think of the tools they had back then. Then lifting these thousand pound stones onto one another. 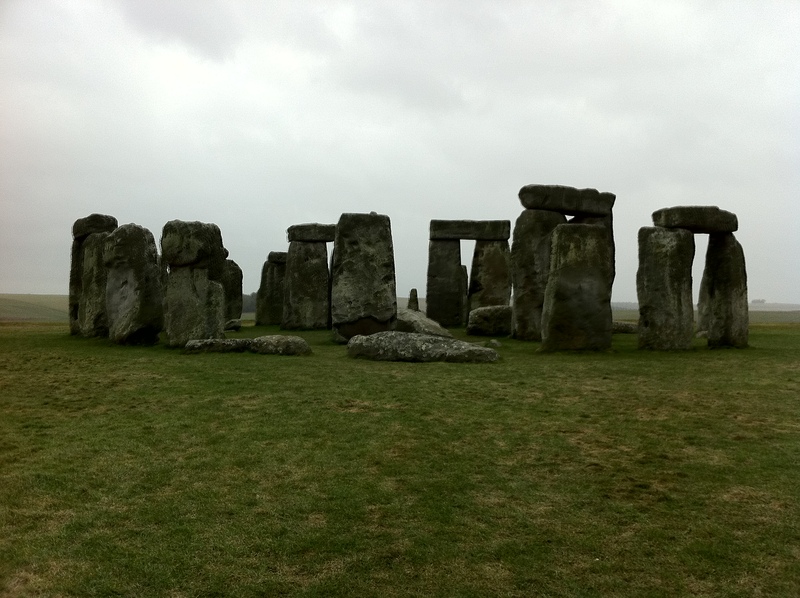 In all, I spent about a hour and half admiring Stonehenge, with over cast skies I was not able to try and figure the tracking of the sun and come up with my own explanation on why the stones were placed here. It was worth the trip and I can say another box is filled on places that I want to see. Leaving Stonehenge behind the next stop was Old Sarum, located just 2 miles outside of Salisbury, this prehistoric castle dating back to 500 BC was later occupied by Romans, Saxons, Normans and then William the Conqueror. Yeah I vaguely remember studying all this in High School. Even with cloudy weather the view from Old Sarum was spectacular of Salisbury and the surrounding valley. All in all very interesting seeing the construction of ramparts and the makeup of the old castle walls. Today all that is left of the cathedral is the stone foot print. Next I headed back to Salisbury, one of the drawbacks of traveling in England during the wintertime is that you end up running out of daylight early, with cloudy skies it seems darkness even comes faster. Walking the streets of Salisbury one easily gets a sense of the history and oldness of the city, from old churches to the clock tower there is more than enough to keep you occupied. I was able to get several photos around Salisbury before I lost daylight. Salisbury Cathedral, the main sightseeing point of city. It always overwhelms me when I first enter these old cathedrals, I always go back in my mind to the book “Pillars of the Earth” by Ken Follett and how he describes in such detail how these churches were constructed. Seeing the great Nave of the church was impressive with it’s intersecting transept, even with the low light outside the stain glass windows were fantastic and colorful. The cathedral has this old medieval clock dating back to the 1300′s, this got my attention for several minutes, trying to figure out and watching the clock work. The Salisbury Cathedral is home to one of four surviving original Magna Carta’s. Dating back to 1215. Even with my glasses on it was hard to believe that this piece of parchment was written with such precision almost 800 years ago with quill and ink. Well, time to head back to London, the trip to Salisbury ,Stonehenge and Old Sarum was well worth it, as with most English towns one could easily spend a couple of days exploring today I was only lucky to get about 8 hours for this adventure. Spending many days in London over the last 6 months I decided to head out for a little different tourist attraction today. I was going to go looking for Abbey Road, for those too young to remember this is the road or maybe I should say the crosswalk made famous by The Beatles, yeah the Fab 4 from the 60's. Abbey Road is also famous for Abbey Road Studios and EMI records, also used by such artist like Pink Floyd, Radiohead, U2 and other well known recording stars. My plan was to jump on the tube and head to Leicester Square and then walk up through SOHO then along the west side of Regent Park and then over to St. John's Wood and Abbey Road. Out with the Iphone and my Google Map to get my bearing and directions from Leicester Square to Abbey Road. It was a nice walk, took me about 1 hour 45 minutes under cloudy skies. Made it to Abbey Road and the Crosswalk, looked a little different than the picture on the Beatles Album cover, main difference was there were no leaves on the trees at this time of the year, the other main thing was the age of the cars parked along the side of Abbey Road. Abbey Road Studios is right there at the crosswalk with the front wall out front covered with signatures from tourist from around the world. 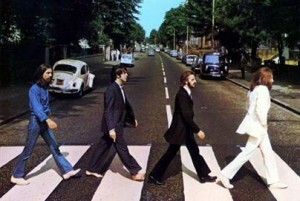 Abbey Road, another box I can check off in my list of things to see. A nice little side trip when you are making your way around London. So if you are in the area of Regents Park or on the way to Camden Market make a quick stop for some music history.